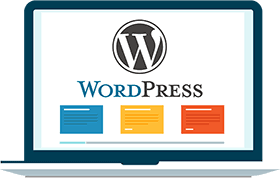 Now free WordPress to compliment your business. Accepting credit cards is a must for online businesses today. Consumers enjoy both the convenience and the security of buying with a credit card 24 hours, 365 days. Doing business by Phone, Mail Order or Internet have never been easier then today. We have been an Authorize.net partner since 1996. The Internet Gateway is a secured interface for business to complete real-time transaction processing . Merchants can either manually key-in the customer's purchase at our website Virtual Terminal or use a Shopping Cart that will connect to the payment gateway to get a real-time credit card card authorization. Using the Internet Gateway, iPhone or Quickbooks is a cheaper alternative then using voice authorization and is the best option for "Card Not Present" transactions. Deposits are made to your bank account within 24 hours. Preview a Virtual Terminal Demo and Ecommerce Integration Methods. Step 1: You, as the Merchant submits a credit card transaction to the Authorize.Net Payment Gateway on behalf of a customer via secure connection from your Web site or shopping cart or from a MOTO center or by using a wireless device. Step 2: Authorize.Net receives the secure transaction information and passes it via a secure connection to us, as your Merchant Acquirer's Processor. Step 3: We will then submit the transaction to the Credit Card Interchange VISANET (a network of financial entities that communicate to manage the processing, clearing, and settlement of credit card transactions). 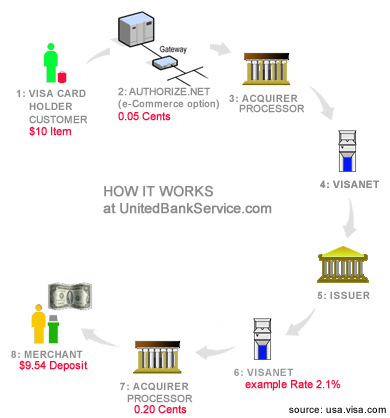 Step 4: The Credit Card Interchange VISANET routes the transaction to the customer’s Credit Card Issuer. Step 5: The Credit Card Issuer approves or declines the transaction based on the customer’s available funds and passes the transaction results, and if approved, the appropriate funds, back through the Credit Card Interchange. Step 6: The Credit Card Interchange relays the transaction results to us. Step 7: We store the transaction results for your statement and relay the results to you, as well as to Authorize.Net. Step 8: We pass the appropriate funds for the transaction to your bank, which then deposits funds into your bank account directly. This communication process averages three seconds or less! Free Scripts None Free Quick-start php scripts plug/play. GoDaddy Hosting Super Center Discount None Upto 20% off ecommerce, domain and hosting products. Monthly Minimum (None) $35 No Monthly Minimum Option (save upto $420 a year). *Bonus discount is part of a Program available for everyone. can lower your rates to interchange or 2.05%. Add 20 cents to end of day batch, for days with sales deposit. See Rates and FAQ for complete details and non-qualified rates. Option offer: Keeping it just as attractive for established businesses, you can waive your annual postage handling fee if you promise to meet just a low $15 monthly minimum of transactions OR an annual postage handling fee of only $19.50 a year is applicable. Apply online and make your selection. Free WordPress or Fantastico with merchant account is simple, just create a ticket, provide us your domain name and we will activate it for you. Please make sure you have the following information available. [ ] Provide an EMAIL address and you can receive status updates.